Kauri Cliffs is a secluded luxury hotel and golf course located on a dramatic coastline. 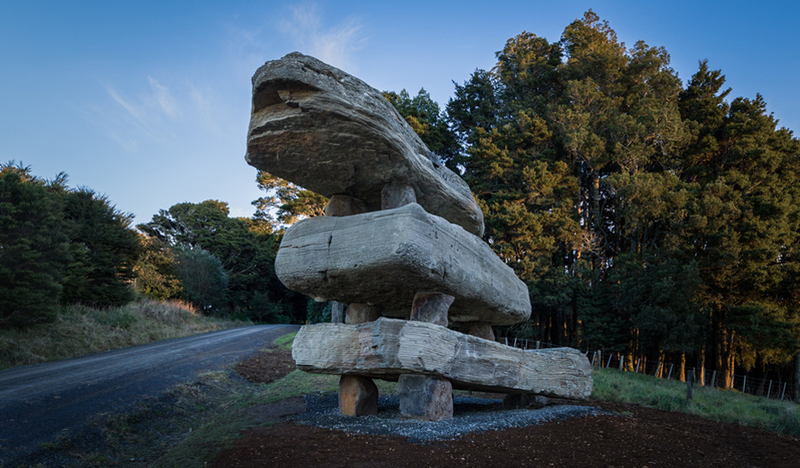 At the hotel’s discrete entrance high on a ridge over looking the ocean and a nearby kauri grove, the owner commissioned me to create an entranceway sculpture. My mission was to make a work that would herald exciting things beyond: breathtaking views, a unique ethos, Kiwi bushwalks, an exceptional golf course, and much more. But most of all to honour the land the sculpture was to emerge from, the nearby forest, and the distant Pacific Ocean. Comprising 3 huge slabs of crystalline sandstone each 20-25 tonne and 10 local boulders, plus exacting engineering, the work cantilevers out into space toward the distant hills, the bay below and beyond.